Should you try one on for size? 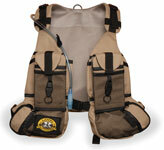 There are several types of fly fishing vest packs on the market today. The biggest decision is whether you should choose a traditional vest or one of the new fishing vest packs. Some are made with a single front pouch, some have two. Still others are designed with a chest/backpack set up. This style usually allows the angler some freedom because you can choose to detach the pack from the vest to use separately. Some anglers like the packs because they are lighter and easier on their shoulders. Others don't like them because they say they stick out too far and prevent you from seeing your feet when you're wading. Ultimately the choice is up to you. Find what is the most workable for you and your needs. Hopefully, you'll be able to find a few tips here to help you decide. The chest pack, or chest vest, is kind of like a backpack. Adjustable straps make it easy to fit over your shoulders and chest for a comfortable fit. Because there is less material involved, they are cooler than a traditional vest, and allow for freedom of movement in most cases. Now to find one that fits your budget. For around $50, you can choose one that is slung over one shoulder, with the strap crossing the body diagonally. A detachable pocket can be moved from front to back as needed. The fly box pocket accommodates a large box. It also features a pliers sheath, a D-ring and a zinger drop tube. Inside, there is a mesh compartment. The shoulder strap is assisted by a stabilizing waist belt. Reviews have rated this sling pack convenient and easy to use. For around $100, you can find several models to choose from. One model offers an ergonomic mesh shoulder harness that helps keep the pack close to your chest. It features a front section that conveniently drops down to hold your favorite fly box. An adjustable central divider makes it easy to organize your gear. A water resistant clear accessory pouch is removable. Another option features padded, mesh-lined shoulder straps and back. Two front pockets are large enough for fly boxes, and zippered pockets can hold spools, leaders, and other small items. Large back compartment is useful for large items. The design distributes the weight evenly, which helps reduce fatigue and helps your balance. Another chest pack is ergonomically designed with lots of helpful straps, D-rings and pockets. Made of water-repellent fabric, it also features attachments for carrying your rod and for your wading staff. This model comes with interchangeable half and full back units. The half back is flat and can hold either the necessities or a hydration bladder. The fullback, on the other hand, is one large main compartment, a rod tube holder and three mesh pockets. Using the fullback doubles the storage capacity, so you don't need to worry about an additional backpack for long trips. Another in this range includes two cedar foam fly boxes that can be removed, a water bottle pocket, removable fly patches, a D-ring, tool pockets, rod holder loops, 11 external pockets, and 8 internal pockets. This model features a fully adjustable fit. Or, you can choose fishing vest packs that are the best of both worlds. There is one that features adjustable ergonomic padded shoulder straps to help suspend your gear as well as guarantee your comfort. A total of 19 zippered exterior and interior pockets give you plenty of storage space. Several climbing cord and elastic loops are attached to help you hang onto your accessories. A hemostat keeper allows you easy access to your hemostat to release fish. Adjustable cinch straps ensure perfect fit while vertical chest pockets are roomy enough for large fly boxes. Two fly benches with rippled foam make it easy to change flies while fishing, and mesh pockets on the outside of these fly benches offer space for tippet spools. 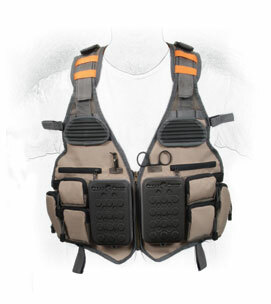 For around $150, you can choose from some fully loaded fly fishing vest packs. One model comes fully packed with float powder and gel, a pack of leaders, a spool of tippet and a pair of forceps, snips, some flies, and a fly box. If you're just starting out, this gives you the full package at one go. Another option in this upper range comes with a hydration system, keeping you prepared even if you spend all day hiking and fishing. This ergonomically designed pack ensures you comfort all day long. A neoprene-insulated bladder will keep almost half a gallon of water available so you stay hydrated. It is easily cleaned. Seven pockets are designed to keep your essentials convenient. Hand warmer pockets will help keep the chill away from your fingers as the evening cools down. High tech is also available in this range. Not only does it look good, it is designed to be convenient for anglers. Separate the backpack from the rest of the vest pack with the click of a few buckles. Another allows you room to pack all your gear in one convenient place. Two molded zip-down fly benches are built in with replaceable foam. Front pockets are water-resistant with taped seams and splash proof zippers. An integrated rod tube holder, two large backpack cargo compartments, an expandable main cargo pocket on the backpack and breathable, waterproof fabric make this vest pack one of the best. Eight large front pockets and four large interior front pockets hold all your essential gear. For further information on fishing vest packs, please check out our ONLINE FLY SHOP.